Does John Carter break the Edgar Rice Burroughs movie curse? This is an edited version of the 1935 serial "The New Adventures of Tarzan." The carnage in this film is appalling. A machine gun is set up and mows down literally dozens and dozens of angry Guatemalan "natives." Why are they angry? Because white people have come into their territory to steal a religious symbol from them. One of the packers is murdered, but his death isn't missed by anyone, not even Tarzan. 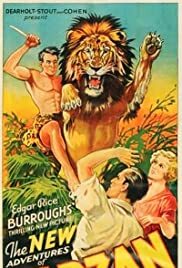 The film begins with Tarzan fighting and killing a lion, and later on he fights and kills an alligator, but he hasn't even got a scratch on him from these encounters. The natives spared the surviving pilot, but no mention is made of the two passengers and what happened to them. The idea that Tarzan, lord of the jungle, would allow the murder of so many natives without showing any remorse would seem to contradict his responsibility as "lord of the jungle." Compare this concept with the film "Tarzan and the Amazons," where the intruders are justly punished and Tarzan protects the "lost' civilization. I appreciate the interpretation given by Bruce Bennett of an articulate Tarzan, but the writers of the screenplay have a lot to answer for in their stereotyping of native peoples who make good target practice.